Since this is not a lot, you could also read my pal John Wheel's comic, PONIES!! !, which it's in its second anniversary and it reached its 100th page! That's almost like a third anniversary. Also, Applejack makes a great Batmare! Why have you have been gone for so long? It is not fair! You must be makin a book as far as I can tell! WHERE HAVE YO GONE! ahh, the dreaded permanent hiatus. Hmmm, more like "IMPLIED to be dead". Ajs parents is this website. Even I didn't take this long of a hiatus! Equestria will never be made again. So with the new season coming up will you be posting new material? And maybe finish the Flank anomaly? Yeah this place is dead. sorry, the site is on this sticky note on my clipboard. 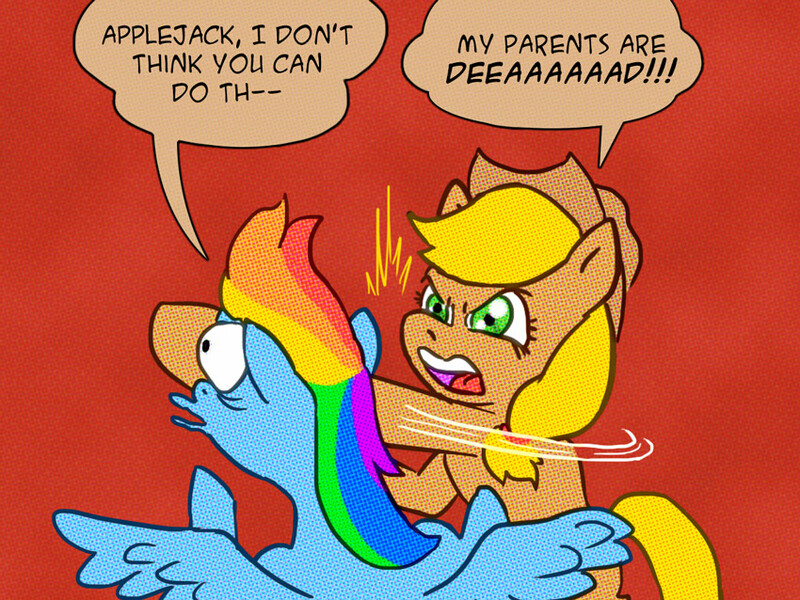 It's not HER fault Applejack parents are dead. Is this it? I haven't checked this thing in a YEAR! um...so ur not continuing the comic? Too bad, this comic had some fun times. I will always wonder what happened to this, it was a great webcomic. Man, I read this comic from when it first started until the end and just now came back, wonder what happened to it? This is like the first time in forever I checked this comic and THERE IS NOTHING NEW!! ARE YOU DEAD??? PLZ PLZ PLZ MAKE MORE!1! i agrees with th efirst post, R U FRIGGING DEAD!!?!?!??!?! He has been gone for two years. I check on this page every couple of months with the hope that one day a new comic will appear.